For this paper, I choose Jennifer Eberhardt who is a social psychologist and professor at the Stanford University, Department of Psychology ("Jennifer L. Eberhardt - Stanford University," n.d.). The theorist investigates the psychological relationship between race and crime. The stereotype of black Americans as violent and criminals have for the last 60 years been documented by social psychologists. Even currently in the United States, racial issues continue to be fluid and volatile. Jennifer throughout the development of her theory was influenced by the historical injustices that are subjected to the black since the era of slavery. To understand the author’s arguments on race, it is important for one to first understand what race is. Most individuals believe that race is what is used to categorize people into different, stable and same groups basing everything on the skin color of a person. Skin tone is used as a categorizing feature. The psychologists, however, suggests that race is not just the characteristics that individuals are born into but in societal and individual levels, a race is a product of different social constructions. 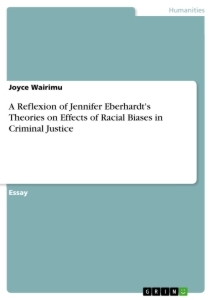 Eberhardt in her studies revealed the extent into which racial imagery and judgments take root into our culture and society and they normally shape the outcomes and actions of the criminal justice system. As a young child, the theorist has been interested in social inequality and perception and when she was a junior high school student, she lived in a populated neighborhood that consisted of the black people and another that was populated by the Jewish people. Between the two neighborhood, Jennifer explains that it a bike ride from one another but the two world were totally different in terms of culture and resources thus the author developed an interest in race and face perception. The theorists began her studies on race during her academics at Harvard when she was concentrating on cognitive studies which are a discipline that examines how people acquire, process and store information although she felt that the field was not right for her and she took a turn basing on the experience she has while she was teaching a social psychology class. The theorist’s biggest motivation for her work is her own color. Eberhardt is a black woman and she grew up in an all-black community in Cleveland until her parents decide to move. The new junior high school that she joined was full of white students and that was difficult for her. The neighborhood she lived was different since each community did things differently and she wondered how that could be possible. Also, she was not worried because people around her were nice to her but they were different and they would joke that all black people looked alike. As it turns out, the theorist had a challenging time differentiating the blacks at the time when she needed friends and this inspired her to study face recognition. When we are unable to read the other person’s face it shows that there is a psychological distance that separates us and we cannot understand what the other group is experiencing. In line with this, the author started to study the tension between community and the police and the troubles they experience in trying to understand each other. The author has also covered the influence of people’s belief about race and where the work examines the dehumanizing association and its impact with an example of African-American ape association. This was her recent work where she aimed at bringing together sociologists and law enforcement to determine the extent of race in policing context (Atiba Goff & Barsamian Kahn, 2012). Through that research, she discovered that the blacks are not only discriminated but also dehumanized. The biases in the race may influence the jury in determining the blameworthiness of a defendant or the crime committed. Also, when both the victim and the defendant are black, the jury takes this as an interpersonal issue rather than an intergroup conflict which is different when the two are of different races. The culture that we live in influence the way we think, act and behave toward the others. In an experiment, the students were asked to look at the computer screen and point at a picture of a weapon or tool when the photos pop up. But before the promised images could be shown the theorist pressed a button where two images one of black and the other was the white and most of the students identified a gun on the black man’s face. From this research, the theorist concludes that our mind is wired to respond to possible threats. This is the same in the American culture where their mind has been conditioned socially to see a black face as a threat to them. This, therefore, affects even the people that take up the role to shun any form of racial bias. An example is the police officers who take an oath to uphold the law without any prejudices and also the people of color themselves. Unless an individual has been brought up isolated, then it is impossible to avoid acquiring the evaluation of the social groups. Eberhardt and other researchers fear that this kind of phenomena may have fatal consequences which might impact the police officer to even pull the trigger when they encounter in their line of duty with a black suspect especially when they feel that their own life is threatened. This may be used as an explanation in the cases of the NYPD where there have been four incidents of white police shooting the blacks where one incident is where a white cop shot a black cop. Racial bias in law enforcement runs deep in such a way that even the training program that the police officers undergo cannot eradicate. In her work, Jennifer addresses the stereotypical association where the Black Americans are associated with crimes. In addressing the issue, the theorist made an association between the black face and the objects matching the stereotype of the blacks. Some of these objects are the crime-related objects and athletic-related objects. The visual images that are associated with crime are guns, drugs and weapons (Eberhardt et al 2004). In most cases, the impact of racial bias that is experienced is influenced by how much those individuals are perceived to be stereotypical members of a certain racial group and in her suggestion, people bias those with stereotypical black features. In two murder cases that were over two decades in Philadelphia involved white victims and black defendants. There were forty-four cases and the photographs taken were rated according to how stereotypical the blacks appeared. The results of the research were fascinating as half of the defendants; the blacks were rated as the most stereotypical and they had high chances of receiving death sentences. No matter the control exerted by the theorist, the Black Americans appeared to be judged and punished according to their blackness. Jennifer Eberhardt acts as a source to the society that is desperately in need of answers and solutions when faced with challenges of race and crime. Her research work has brought light to the biases by juries and police departments. In the study of a raw convict, Jennifer together with her teammates found out that the black defendants who possessed black features like dark skin color and wider nose were likely to receive a death penalty. Moreover, she has addressed how deeply the biases subjected to the blacks affect the law enforcement. The history of social psychology is based on the pursuit of the roots of, solutions, prejudice and the inter-groups conflicts. Race relations have been explained through classical and contemporary theories and they have been successful in uncovering the cognitive and motivating underpinnings of discrimination and prejudice. Intergroup relations implicates social race and they have been reviewed using social psychology theories. In the United States racism was promoted in the mid 19th century by Josiah C. Nott and George Robins Gliddon in their book named ‘Types of Mankind’ which was misleading because it suggested that Negros ranged from Greek and chimpanzees. From this book, the theorist doesn’t understand how the history that has existed for many years goes away completely. But the truth is it still prevails within us. This history is hard to erase especially when it is dealing with racial inequalities and it fuels and maintains the suggested association even in a way that people are not aware. Racial inequalities are also associated with historical events like the scientific study which enforces that the blacks are less evolved than the white. An example is seen in a book ‘Early Man’ that shows an illustration that evolution began with chimpanzees and ended up with white man hence when every time a white person who has been educated with science from this book sees a black man all they see is incompletely evolved man simply because they are not white. This study is not intentional but from it, people walk away knowing that people who are African-American are closer to apes than people of the European descent and a white man always comes to the mind when the issue of civilized man is raised. There before, African-Americans were associated with apes and although that notion had disappeared from the mainstream of the America, it still exists where though subconsciously most Americans do still associate blacks with apes as shown in the study by the theorist. Due to these perceptions, people of different race find it hard to accept the blacks as human and the society is more likely to condone the criminals. The theorist although she worked with other researchers, her subject of the study came after the civil rights movement and Jim Crow. Even when the young men did not understand the historical background of the black-ape association, they carried on the association. Even with the widespread fight against racism, bias still exists and the blacks are still dehumanized and they are still associated with apes. This association can be interpreted as the approval of the law enforcement officers to beat up the blacks and it also has more consequences. In her work, the theorist explained the police brutality toward the whites where their body cameras showed that white police officers more often talk to white residents but when addressing the blacks they use abusive language. This shows the disparities in the officer’s language and it corrodes the police-community relationship. Jennifer, while carrying out her study, she collaborates with OCPD to study racial discrimination in policing. The disrespectfulness between police and the community may be caused by tension that is all over the US and is evident that the tension influences the language that people use to each other. After completing her experimental studies, she concluded that the findings found did not indicate that the individual white police officers were biased but rather they were respectful to all individuals despite their color only that they respected the whites more than the black and this doesn’t mean that they were disrespectful to the blacks. There have been civil rights movements that are used to fight the injustices subjected towards the black. An example is the Black Lives Matter which came to existence after the shooting of police to a teenage black boy who was unarmed. Most of the activities that the BLM holds are used to protest the police killings of the black people and their brutality as well as the racial profiling. According to Jennifer, racial profiling is where there is a perception that is circulating about the blacks. People are stereotypical about the blacks that they are criminals and their color is associated with gangs and weapons. These same reasons that the psychologist explains are the same that have led to mistreatment of the blacks because even a police officer lives in the same community and has been through the same science education. Therefore, when a black face is seen by an officer they feel threatened and they end up shooting. The movement came to live in 2013 after an incident of the shooting of a teenage African-American boy. The boy was shot by George Zimmerman just because he was black since he was unarmed. Zimmerman was a captain of the neighborhood watch and not a police officer showing that brutality and injustices towards the blacks are not only subjected to blacks by the white police officers but also by white citizens. The message that is conveyed by the movement is misunderstood and as a result, all lives matter came up. However, Black Lives Matter is a movement that fights police killings of the blacks and they base their arguments on the many cases that exist where the blacks even unarmed have been shot by law officers or have died in police custody. On the other hand, all lives matter is a fact and not a movement and it is true that all lives matter. On another view, the BLM movement has been accused of being anti-police. Additionally, some individuals view racial biases as unconscious problems but they believe that it should be viewed as discrimination. Communities still question whether implicit bias is not just a cover for racist behavior but scientists believe that everyone is in control of their behaviors hence discrimination behaviors should not be taken as implicit. Eberhardt suggests that getting rid of the bad people by focusing on racism at individual instances will not solve the problem. Instead, she says that emphasis should be on changing the cultural and institutional settings that promote the biases. In particular, labor policies that create racial discrepancies should be fixed. The protests that have been caused by police killings of the blacks are the cost of not seeing or pretending to be blind to bias. As a result of the presence of the law that discriminates the blacks, the blacks feel that the state doesn’t protect their rights and that the state doesn’t fully identify with their pain. The psychologist acknowledges that progress has been made that ranges from new policies to new training and greater attention have been given to the issue as well as individuals are becoming open. Eberhardt research has been criticized for being biased in the publications. In most of her research, the author has worked with police officers to try and unearth racial discriminations but this is not enough. In the US it is not just the police officers who are racist but many other individuals in the country. Therefore, working with officers only will reduce police killings and police brutality but it will not end racial bias or improve interracial interactions. To end tension between the community and police is important but it cannot be done without a proper strategy because it can exacerbate biases. Police killings to the black cannot be encouraged but individuals even the blacks should understand that even the perfect and best officers are human and might practice biased policing and sometimes they act depending on the situation ahead of them. Ignatiev and the “Race Traitor Journal” – How Realizable is his Theory?